MESH released their debut album ‘In This Place Forever’ back in 1996 and since then, have become the UK’s secret musical export to the EU. Although little known in Britain, founder members Mark Hockings and Richard Silverthorn made their fortunes in Germany. In fact, the Bristol outfit were so highly regarded at the turn of the century that their 2002 album ‘Who Watches Over Me?’ was released on Home, a German subsidiary of Sony where one of their label mates was KARL BARTOS. Their back catalogue has been noted for rousing tunes such as ‘Trust You’, ‘Little Missile’, ‘Crash’ and ‘Only Better’. 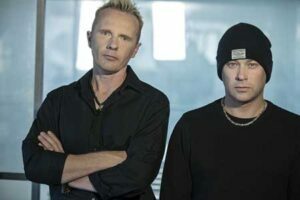 With their electronic rock based template on albums like ‘We Collide’ and ‘A Perfect Solution’, MESH have often filled the void apparent in DEPECHE MODE’s inconsistent 21st Century output. Indeed, the brilliant ‘Taken for Granted’ from the latest album ‘Automation Baby’ is a stadium friendly stomper in the vein of ‘Never Let Me Down Again’. Meanwhile, the album’s opener ‘Just Leave Us Alone’ is a classic MESH anthem veering to euphoric trance while also throwing in the odd dubstep drop. But ‘Automation Baby’ is not all an angst laden thrust as the atmospheric maturity of the album’s ballads indicate. The beautiful ‘The Way I Feel’ shows a more sensitive side with hints of ENNIO MORRICONE while ‘Adjust Your Set’ possesses some subtle traits despite its mechanical rhythms. And with the appropriately titled ‘You Couldn’t See This Coming’, Mark Hockings’ passionate vocal resonates over gentle step sequences and orchestrated backing to make for a highly appropriate scene stealer. Multi-instrumentalist Richard Silverthorn kindly spoke to The Electricity Club about how MESH could now finally be getting the artistic recognition they fully deserve within a reinvigorated electronic scene. How do you think the general reaction has been to ‘Automation Baby’? It’s probably the best reaction to an album we have had to date. With every album we put out we feel great deal pressure to better the last one. ‘A Perfect Solution’ was very well received by the press and the fans so when we started ‘Automation Baby’, we knew we had to up our game. Overall, it appears to be less intense than its predecessor ‘A Perfect Solution’ although it is still emotively strong. How did you get inspired to base the album around the theme of virtual relationships? It was something we noticed going on around us. Technology plays such a big part of modern life. Social media sites, mobile phones and emails are taking over from real social interaction. So many means of communication yet there are still some very lonely people in the world. Our constant quest for fame wealth and popularity at any cost. All these things seem to be on the increase. It is our take on these subjects. You’ve thrown in a few dubstep influences alongside the cutting Eurotrance on ‘Just Leave Us Alone’? When we toured the USA in 2011 our roadie introduced me to the music of SKRILLEX. At the time I was just blown away by the sounds, not necessarily the songs but the huge synth sounds and the aggression of it. I like the idea of incorporating some of my influences in the music we write. I think what these guys are doing in the dubstep scene is quite pioneering in the same way synthpop was in the eighties and acid house and trance was in the nineties. Although ballads have been a part of MESH’s repertoire, songs like ‘You Couldn’t See This Coming’ and ‘The Way I Feel’ were a surprise to some? We have always liked the thought of stirring an emotion in people when they listen to our music. For me personally the best compliment some someone can pay you is when they say they were really moved by a song. When we wrote ‘You Couldn’t See This Coming’, I think we knew this was going to be a quite emotionally charged song. We did a short making of video of this track up on YouTube and the comment were fantastic, the word “goosebumps” came up many times. With ‘The Way I Feel’, Mark put this together around a simple guitar riff he played and as the song developed, again we could feel a sense of strong emotion coming through. What was the creative dynamic between you both for ‘Automation Baby’ and how has it changed since your previous albums? Mark and I have quite an odd way of writing I guess in the fact we don’t work together at the start. To come up with the initial idea we work on our own, it is something we find easier. I also think it is what keeps the albums varied. Songs that Mark writes are quite different to what I may put together and vice-versa. When we have a frame work that is the point we get together and work on it until it’s finished. With ‘Automation Baby’ the only thing we changed was the speed in which we write. By that I mean that we would not spend too long on the production side at the start and just concentrated on getting a well structured song. All the production and programming came at the end. We felt it sounded fresher and more spontaneous working this way. You suffered from DEPECHE MODE comparisons early in your career but have since developed your own sound. Have you had to consciously do that or has DM moving further and further away from their roots also helped you to continue your natural path unhindered? A lot of the comparisons were down to lazy journalism we felt. It is so easy to use DEPECHE MODE as a comparision for an electronic band in the same way as if you were a Metal band people saying you sound like AC/DC or something. I suppose on the positive side is if someone say you sound similar to one of the world’s biggest bands that is not a bad thing. I think what Depeche are doing these days is very different to what we are doing. It’s blues done using electronics. You’re not about to start adopting blues scales? Erm… I don’t think so. And the fact I don’t know any! One of the things that sets MESH apart from other Future Pop or electronic rock acts is your sense of rousing melody. Where does that influence primarily come from? It’s just what comes from Mark and myself. We are melody junkies. I love writing songs with a huge melodic anthemic chorus that makes the hair on the back of your neck stand up. It has almost become expected of us nowadays. Many electronic acts have a predominantly male audience but MESH would appear to have a significant female fanbase. Why do you think that might be? Well I would like to say its down to our good looks and charm but… 🙂 I don’t know really, perhaps it is the fact that the songs show some vulnerability and sensitivity that us blokes aren’t supposed to show. Perhaps that is what they connect with. It takes the listener to a place that is full of sentiment. It’s not a bad thing eh? With your success in Germany, you are well positioned to speculate about the tastes of European music audiences compared with the UK? So why are the Germans more appreciative of MESH? It’s not just us. The Europeans and especially Germany seem to be more open to all different styles and genres of music. Their charts reflect that which is cool. Here in the UK, it is just what is being played on Radio 1 that is known as popular music which is very blinkered and misleading. Electronic music has always been well supported by the German audiences. There is a really healthy scene for it. Lucky for us they have really embraced what we do. We have done many headlining tours of Germany and picked up loads of loyal fans. And why does it appear that the Germans are generally more loyal to the artists they love whatever their genre, compared with the fickle attitudes of the British? That is something I can’t answer. They certainly are fanatical. Bands like DEPECHE MODE are still seen as Gods over there. In the UK, bands seem to have a very short shelf life and if you are not in the charts for a couple of months the media moves on to the next big thing. Longevity here in the UK is a rare thing indeed. Despite the seminal Synth Britannia years between 1977-82, there is still a comparatively negative attitude towards electronic based music here unless it’s dance or pure pop? Again this is a media thing. Let’s face it, most mainstream music these days is made using computers and technology in some way of another. The key to success is how you portray it. HURTS are a good example of this. They are seen as a trendy band here in the UK and turn up on all different kinds of TV and radio shows but ultimately they are just a synthpop band with a cool image and a very good PR person behind them… good luck to them. Are there any untapped territories for MESH from a playing live point of view waiting to be fully exploited? We have a good following in Russia and parts of Eastern Europe and have played there many times before, in fact we are off to Moscow again in October. I think the US is something we would like to do again. We toured right across the states in 2011 but it’s something you need to do a few times to really see an effect. Our US label is quite supportive of us going over but there are a lot organising and costs involved in doing such a tour. You chose some great new acts like TORUL and SINESTAR to support the recent European tour. Where did you discover them and how do you assess their potential? We have this policy when it comes to choosing support bands. We have never been one of those bands that choose something bad that make the headliner look good (as so many do). For us, it is better to have a strong line up to make it a great evening for everyone who comes along. TORUL came to our attention through a gig promoter we know. I really liked the snippet video they put out to promote their new album. It sounded unique and had a very cool vibe about it. It turned out they were probably the most well received support we have had. A lot of people bought their album and passed many positive comments about them. SINESTAR we have known for ages. We met where we rehearse in Bristol and have kept in touch ever since. It was their goal to get into the European scene and they approached our tour management to see if it was possible to do an opening slot. They done a great job, things are looking up for these guys. We still have a more shows planned for this year. Next is the M’era Luna festival in Germany which is a massive alternative festival attended by 20,000 people, a real highlight. Then we have two Spanish shows in Madrid and Barcelona in September. We have also just confirmed a Russian show in October, so quite busy. We are still talking about and arranging a possible second single from ‘Automation Baby’ as it has been so well received by the radio stations so strike while the iron is hot.